Triptykon/Celtic Frost/Hellhammer :: View topic - Demon Entrails - song?? Posted: Tue May 23, 2017 12:45 am Post subject: Demon Entrails - song?? I remember reading somewhere that there is actually a song called "Demon Entrails" by HH. ironically not on the Lp set. Also ,that it is their fastest song. is this true or did I misread something somewhere or my memory is just bad. if so , does audio exist of it ? curious to hear it. "Demon Entrails" was indeed a song written and played by Hellhammer in late 1983, but never recorded. It was the band's fastest song. The meaning of the title "Demon Entrails" seemed perfect in its symbolism to outline the demo release project. To me both songs sound radically different. Demon entrails has/had a blastic intro and is/was damn fast. If there is a connection, maybe does it concern the lyrics - but the ones of Demon Entrails are quite undecipherable. Yes, I would like to hear that tape too. Sounds like a sham. For in reality, the song "Demon Entrails" never had any lyrics. It was an instrumental. There exists no recording - rehearsal or otherwise - of the completed song "Demon Entrails". The original tape I have has been sold to me a while ago by Erich Keller - who recorded it with his walkman while the HH recorder failed during a rehearsal session. This is thus no fake or sham. My comment of "a fake of sham" clearly referred to the earlier statement about the song's lyrics and their relation to a subsequent Celtic Frost song. As I knew that there exists no recording of "Demon Etrails" with lyrics, this assessment was utterly implausible. And indeed, it is stated in a post above that there are no lyrics after all, but merely talk before the song (i.e., something completely different). With regard to the story behind this Hellhammer rehearsal tape: with all due respect (and sincerely so! 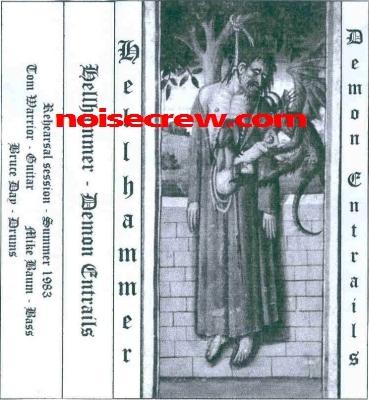 ), not all of those who have sold Hellhammer/Celtic Frost rehearsal tapes and demos have been entirely truthful in their submission of information regarding either time frame or circumstances surrounding these tapes. For example, and without mentioning any names, one of the individuals mentioned who has sold such tapes has repeatedly, and for a variety of personal reasons, massively overblown their experiences, association, and alleged insider status with the band. The reality, of course, was somewhat different. Incidentally, yesterday I received a detailed mail from Bruce Day in which he sent his recollections of Hellhammer for the book. These recollections include references to "Demon Entrails", and they corraborate the statements I have made in this thread. I got that tape 6 or 7 years ago - and didn't listen to it for years. I also had in mind the truly faked TOD rehearsal version (dated 1981 or 82) which appeared on one bootleg with a very bad quality. I just got confused about all those memories ( I even have a faked live recording of HH with a very noisy crowd). I guess that the other tape I got from Erich (the CF one) is genuine, as well as the HH newsletters. The fact that some people "massively overblown" their links to HH doesn't make this tape a fake. By the way, Erich still owes me a couple of tapes from a six years old trade, so I'm not especially a fan of him. Once again, I didn't say that the tape itself was a fake. Incidentally, the statement regarding Bruce Day was not meant as a challenge to you by any means. It was merely a coincidence to receive his recollections regarding "Demon Entrails" at a time when this song is discussed here (probably for the very first time ever). This should conclude my contributions to this thread. Even though the Rehearsal is 25min, it is a constant Revelations Of Doom practice, while in the last 30 seconds they play the song DEMON ENTRAILS. An instrumental one, and as said, only 30 seconds, followed by 3min more of blabla. And if you understand German you may recognize from the talking in between the rehearsal why Mike Owens wasn't in the band for a very long time. The audio was published on the internet a decade ago (http://www.celticfrost.com/Hellhammer.zip actually), but does not exist there anymore. Maybe you find it somewhere else on the web. EDIT: the cover was actually done by pignouf for himself if I am not mistaken. On youtube is just 15 min. of the Rehearsal of Revelations Of Doom in 1983. The 30 seconds of Demon Entrails is missing. I have found the files in my archive. Tom, if you agree i will upload this two files of Rehearsal Summer 1983 on the internet. Ah! well I guess this clears it up. sorry if I'm going over old ground. I haven't been here in quite awhile prior to coming back as of late . thanks! In this case not needed anymore?